Blender 2.80 is using a new toolshelf and toolsystem, so we need to update the toolshelf in Blender's clip editor too. The workflow for tracking in the clip editor used to be split between toolshelf on the left and sidebar on the right. In the toolshelf you would start setting up your scene length based on clip length, prefetch footage etc. Then you would set the tracking settings for new markers in the toolshelf. However, the tracking settings for the active track were in the properties sidebar to the right. Solving and cleaning were on the left in the toolshelf. So overall, the clip editor was using the concept of toolshelf and sidebar rather loosely. The toolbar is the place for active tools, the toolshelf Tabs are gone. However, now we have Tabs in the sidebar. So we need to update the overall design of the clip editor and also think about how we can adapt the tools and operators to the new workflow. The following tools should only be relevant to the Clip View, not for Graph or Dopesheet View. 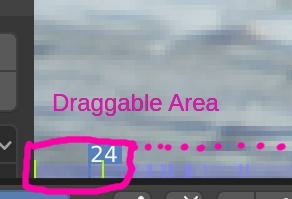 There left-click+drag should only move the time cursor, just like in regular Dopesheet. The closest thing to a new tool is probably Add Marker. We used to just Ctrl+Click to add a marker, which is very convenient. Maybe we can keep that too. However, the new toolsystem would make it possible to move all the settings to the topbar (and hence to the tool settings in properties editor as well). So you choose the add marker tool. In the topbar you can adjust the settings for new markers. Here's a screenshot of the settings currently in the toolbar. To adjust the settings of the active marker you can still use the track settings in the sidebar. With the Add Marker tool active you should still be able to track. EDIT: The Add Marker tool should not only add the marker, but also move it, as long as you have the mouse clicked. Just like Ctrl-Click now in 2.79. The Clip Editor has a little playback area at the bottom. So the add marker tool would have to respect that, so that we have the tool active but can still drag the time cursor in the cache/playback area at the bottom of the editor. Another active tool could be box and lasso select. Annotate just as in other editors. It should, however, be still possible to assign the annotation to the mask (Data Source), for track masking. There are some other tools I could think of, but those are maybe something for later and would require a bit more discussion. For instance, maybe it would be nice to have an orientation tool. Activate Orientation tool. By default it would be set to "Floor". Once you picked 3 markers they will automatically be set as the Floor. (Maybe even with thin relationship line between them to indicate they are the floor? Could have an option where you Ctrl-Click for Set Origin, Shift-Click for X-Axis and Alt-Click for Y-Axis. Could have a mode to set the scale. 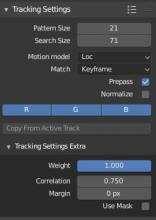 Tool Setting would be the scale (default=1.0), tool would work in way that if you connect 2 tracks it will apply the scele to the scene. Masking could benefit even more from the active tools concept than Tracking. But even though it is part of the clip editor I would rather open another Task for that. These features are already underway, and to be blunt, D2771 is absolutely necessary in a professional vfx studio that has to crank out perfect tracks for many shots a day. Sometimes tracks drift, it is the nature of tracking, and currently we have no way to correct for that. Also, Sebastian, you tool for quickly creating geometry after a solve has been done by selecting 3 or 4 track points and clicking a button. That workflow simplifies set reconstruction exponentially. What if I have a shot with a camera moving towards a wall, for example? I might start with a small Affine marker, which get's larger and larger the closer the camera get's to the wall. At a certain point I have to scale up the search area. I might even have to activate Normalization and Brute Force at the end of the track. So those settings would now be used as default settings for a new marker? That would be very unideal. I think it's okay to have these two different settings. And I think it will be even less confusing with the new tool system in 2.8 than in 2.79. In 2.79 we do have 2 almost identical looking panels in toolshelf and in sidebar, indeed. Now in 2.8 we would only have one of these panels in the sidebar, and the other settings would be in the topbar, as with every other tool. To me that seems much more streamlined and less confusing. Now, I do sometimes want to use the settings of current track as default as well. Of course! But we have an operator for that (Copy From Active Track). Currently that operator is in the Tracking Settings in the toolshelf. In 2.8 I would move this button into the active Track settings and rename it to something like "Make Settings default", or so. That way it is easier to apply these settings to the Add Marker tool. You'd not even have to touch the topbar toolsettings for it. Btw., I totally agree about the two patches, both very useful! 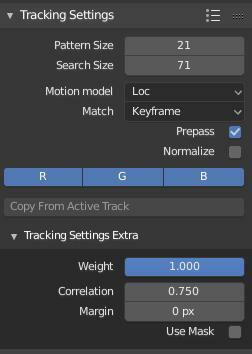 Regarding the two Track Settings panels, yes, I understand that workflow you describe, and I have no problem working with it the way it currently is. But when I think of all the other programs I have tracked in, not a single one has two of the same panel for changing the settings on new markers and the current marker.